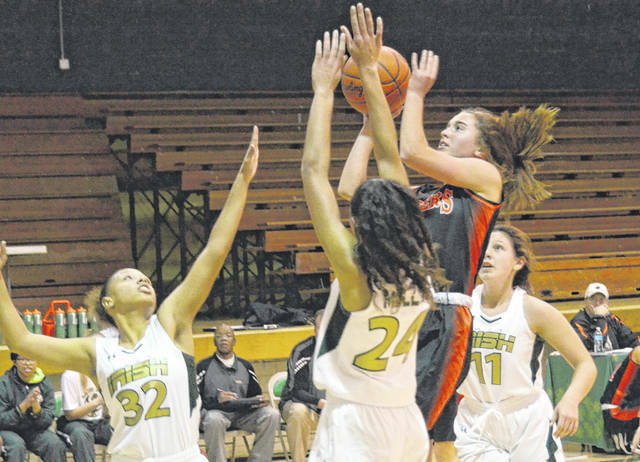 SPRINGFIELD – West Liberty-Salem pulled away down the stretch and beat Catholic Central, 46-35, in OHC non-divisional girls basketball on Monday. It was the 11th straight win for the Tigers. The game was tied at 31-31 with four minutes left when Gabby Hollar pulled up and hit a game-breaker of a three-pointer to nose WL-S in front. Hollar had 9 of her 12 points in the fourth quarter. “She plays hard. And they were face-guarding her and Kelsey (Day) most of the night. But she still finds ways to get to the basket. That’s just the way she is,” WL-S Coach Dennis McIntosh said. The Tigers seemed reticent to shoot from the outside early, and fell into a quick 10-4 hole, but rattled off three consecutive baskets in the final 90 seconds of the first quarter to tie the game. With less than seven seconds left in that first quarter, WL-S’s Grace Estes accelerated through the defense from half court and capped off the opening stanza with a layup at the buzzer. Estes finished with 14 points to lead the Tigers offensively. The visitors crashed the offensive boards and made the most of a few Catholic Central turnovers in the second quarter, moving out to a 16-14 lead at intermission. The Tigers (11-3) crashed the offensive boards and denied both penetration and passing lanes – something often difficult to do against the Irish (12-4), who love going to the hoop. In the jayvee contest, WL-S won 25-13. Hallie Smith had 12 points for the Tigers. West Liberty-Salem plays at Madison Plains on Wednesday and at Northeastern on Thursday.